As a thorough bred Angeleno, I have been conditioned to believe that making unintentional physical contact with a stranger is a serious offense if apologies are not exchanged. If I am walking along the luxuriously wide streets of Los Angeles, it is relatively easy to visually determine a path of travel that lets me avoid rubbing shoulders with passerby. Maintaining one’s distance is an unspoken but unanimously accepted code of conduct. Any occasional intrusion of a stranger’s path or brief touch may be forgiven by a “pardon me,” but on the whole, one can usually walk several city blocks and remain sterile in LA. I took these rules as commonplace, but I quickly learned in Hong Kong that maintaining one’s personal space is far from a universal practice. For the first days during my stay in Hong Kong, I muttered “sorry” and “excuse me” whenever I brushed arms or shoulders with fellow pedestrians (which, incidentally, happened quite frequently), but I was usually met with confused or blank expressions. I considered a language barrier to be part of the issue, but the sheer lack of effort made by the locals to return any apology made me think differently. Within a population-dense city, physical contact is naturally bound to occur frequently. In that sense, the elimination of apology in the case of contact seems logical and highly convenient in a place especially like Hong Kong. If avoiding contact is the etiquette for walking the sidewalks of LA, than a mutual understanding that space is limited seems to be the established attitude for Hong Kong natives. Touch is inevitable and an ephemeral aspect of the city, and resultantly, it is an acceptable social condition. The loose mentality that Hong Kong people hold toward keeping personal space can also be felt within the architecture of the city. The streets that present opportunities for contact between strangers visually reveal this attitude. 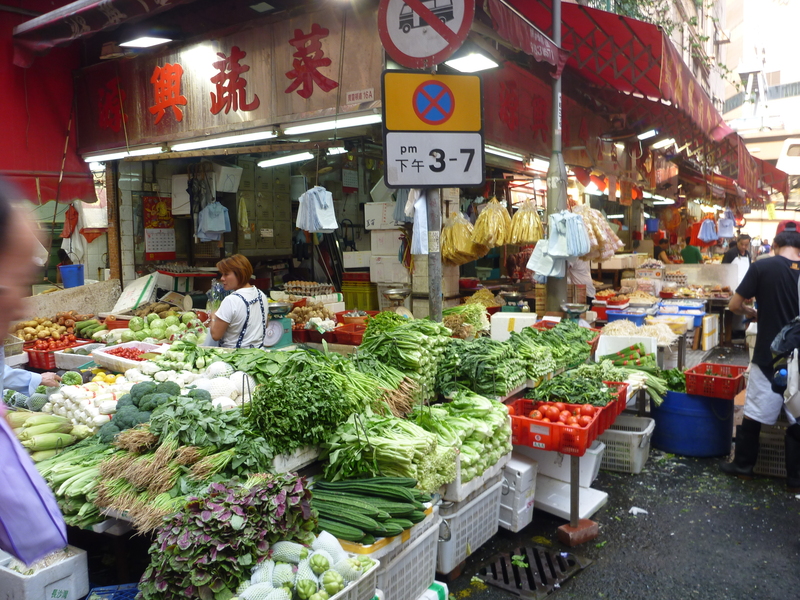 The entrances of the small shops of the older Hong Kong fabric meet and readily blend into sidewalks. The demarcation between neighboring vendors is informal and often vague. Passerby can feel the cold air of AC units blowing into the street, and merchandise is displayed within an arm’s length away. The stacking of brightly lit shop signs and advertisements looks just as chaotic as people moving in the street. It is a spectacle to behold. Being such a visually inclined person, feeling the difference between LA and Hong Kong was bizarre. The physical disconnect that I grew up with in LA undoubtedly estranged me, and Hong Kong felt a world’s away. Having someone always next to you was an unshakably haunting thought, but I also realized how equally problematic the LA alternative was. These two conditions are on opposite ends of the spectrum, but their effects on man are surprisingly the same. Desensitization takes place. In The Metropolis and Mental Life, Georg Simmel describes the phenomenon as follows: “the nerves find in the refusal to react to their stimulation the last possibility of accommodating to the contents and forms of metropolitan life” (415). Man tolerates his surroundings and environmental conditions to live another day. A few awkward touches here and there, but life goes on.